A holiday with peace of mind. 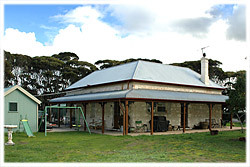 Cape Cassini Wilderness Retreat is the only accrediated ecolodge on Kangaroo Island. We provide the perfect escape down a private road through 1000 acres of coastal wilderness to a clifftop paradise with fantastic ocean views.Your hosts Pat & David offer a choice of two experiences. Guests can enjoy hosted accommodation and exclusive 4x4 touring or if you wish to be more independent we offer self catered Bed & Breakfast with breakfast provisions and the unique advantage of hosts nearby in a separate wing for help and advice. Watch the kangaroos, wallabies and birds from the comfort of the retreat, enjoy bushwalking, take a guided tour, experience the beauty of the sea and shoreline. 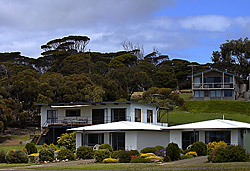 Casuarina Coastal Units, located in an idyllic setting at the far end of American River on Kangaroo Island, offers self contained, family accommodation to those seeking a quiet, relaxing holiday. We are conveniently located for many of the island's attractions and American River boasts some of the best fishing around. At night, we are regularly visited by Tammar wallabies which like to feed on the grass around the units. Come and see us - but allow plenty of time, there's more to see and do than you think. Dudley Villa is well situated, just 1km from the picturesque township of Penneshaw on the main Hog Bay to Kingscote Road. All beds are supplied with linen and there is also a porta cot availble. Outside there is plenty of room to pitch a tent or sleep under the stars in a swag,which are availble on site. 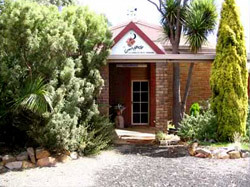 Modern self catering accommodation situated in the heart of Kangaroo Island at Parndana township which has a fascinating past and a living heritage. Parndana's main street character takes you back to soldier settlement days after the Second World War. The towns' facilities include a supermarket, seven day bakery, post office, community hotel, petrol and mechanical services. 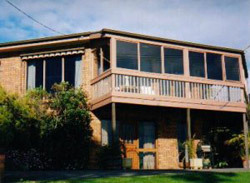 The township is surrounded by natural bushland abundant with wildlife. 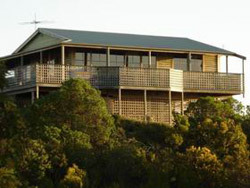 Close to Flinders Chase, Seal Bay, Remarkable Rocks, Admirals Arch and much more. Our three two bedroom units have a three star rating and our one bedroom unit has a four star rating with AAA Tourism. Relax and enjoy the fabulous views and tranquil surroundings of Vivonne Bay from the sundeck. The quaint cottage is fully equipped and comfortably accommodates eight people making your stay as pleasant as possible. Island Time Holidays Fleurieu Peninsula and one at West Lakes, a suburb of Adelaide. Koopalanda Dreaming bunk. Full kitchen including microwave and dishwasher. Separate toilet, shower and princess bath, full laundry facilities. Two lounge areas, one with Austar TV/Music. Children welcome. Toys, books, games to suit from birth to family. All linen included, right down to flannels and beach towels. Lantauanan - The Lookout Lantauanan - The Lookout has ambience, location and comfort. 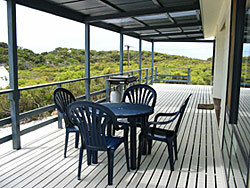 Balcony dining to stunning views of the ocean and native bush. Lantauanan is self catering and fully equipped to AAA Tourism exacting four star rating. 200 metres away from safe swimming family beach. Boat launching is at the next corner. 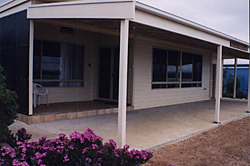 The three sided spacious verandah has a gate safe for youngsters. Relax and watch the ocean from your fully self contained luxury suite which boast the most spectacular views of the sea from your lounge and bedroom. Prepare your own meal or snack in the fully equipped kitchen, or visit one of the excellent restaurants in Penneshaw. 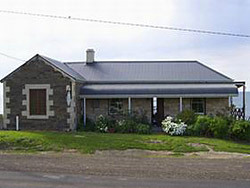 Fully hosted bed and breakfast accommodation in a large four bedroom house which can accommodate up to twelve guests. Modern style fully hosted bed and breakfast accommodation with all facilities and ensuite bathrooms. Prices shown on this web site are for 2 persons sharing. 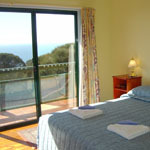 Our "Seafarers" accommodation accommodates up to 6 people in three bedrooms. Additional costs: $15 pp (per night) 'off peak'. $20 pp (per night) 'peak season'. Historic Surbiton-at-the-Cove is the ideal place to relax and unwind. Whether a cosy couple or a group of up to ten, this warm and welcoming home is a wonderful base for site seeing around the Island, or enjoy the many historic, geological and environmental features that Penneshaw has to offer. Walk to the Cove at your doorstep for a spot of fishing, or to the shops and restaurants at the other side of the Cove to sample local Kangaroo Island food and wines. Price is for 2 people. Minimum 3 nights stay. Cottage sleeps 10. Additional adults are $15 per person per night, children $10 per person per night, payable upon arrival. 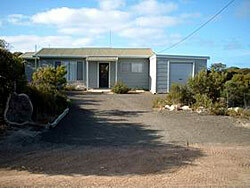 Two spacious older style three bedroom houses located within 200 metres of Emu Bay beach. Fantastic sea views and a safe beach for children. Located within easy reach for day tours of the islands attractions. Two self contained units with modern amenities and furniture. Ideal for families.